A salesperson may utilize a large number of the distinctive sales process to uplift business drastically. Before that, they will know about the tools application in a practical way. Some tools are significant and trustful for utilization than others. These are the best pre-approach process like - Pre-sales preparation, sales presentation, objection handling, prospecting, pre-approach and closing of the sale. A selling agent may set the priority of the first approach. Because they will know about the priority of the customer and will do accordingly. They should change his setup according to customer views and necessity. 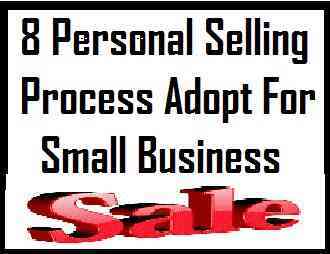 A) Pre-Sales Preparation- This the first process to adopt before start selling the product of Small Business. Sales preparation should be perfect in all respect. You should know about customer behavior and need. Your preparation approach should resolve the problem of customer and fulfill his demand. First, you will be familiar with the product and know about the product USP, and share all benefits and other details with the customer. You will be definitely successful to sale the product if you are aware of the unsatisfied needs and the problem of the client. Your positive approach satisfy customer then it is possible that the client takes your service and product in the coming future. B) Prospecting - The potential customer is known as the prospect and the method of finding the potential customer is known as prospecting for online and offline product purchasing. You can locate potential customer for your product by analyzing the phone directory, cold canvassing method and from other resource or process. The analyzing of prospecting customer depends on your broad thinking and approach level. A prospect has unsatisfied need, the purchase and willingness to buy the product. You have to select those customers by your analyzing power, who need your product and have the capability to pay the selling amount. If you work on prospecting, it is clear that it will take a significant amount of time, effort and money. To know about the prospect of the customer, you can find through current customer, by cultivating referral sources, enter in some organization and interact with people, share your product USP with colleagues and friends. Prepare your data or try to collect data from other legal resources to know the prospecting client. C) Pre-approach - This approach is the method to find out needs, problems, preference, habits, customer attitudes, his nature and interests. Number time, it has been seen that specific information and interest is collected about your prospect from other resources. Your success depends that how fast you can know about the prospecting demand and know about the prospects' needs and attitudes. Your sales presentation depends on the approach to knowing about the needs and purchasing power of the prospects. These are the method you can adapt to successfully give your presentation and approach. D) Approach - Now focus on the approach to sales. The basic function of your talk with the client is that you have to sustain and get the attention of customer's. Before all these steps, you have to introduce himself by using the phone. Then obtain the introduction of customer and handing your business card. The first approach of your side to attract customer and they take interest in your talk. The best techniques for this purpose are the benefited approach, reference approach, sample, and mutual approach. The reference approach enhances the prospect of selling if his friends referred to purchase the product and count the benefit of that. Similarly, you can say that the sampling approach involves giving the sample to the product and provide details. The best way is the mutual approach. It is the supreme method to know the prospect. The first method of approach is critical because it makes a lasting impression on the client. The final conclusion is that the customer should agree to talk with you and want to know about the product USP. E) Sales Presentation - The presentation totally depends upon your creativity. Great presentation promote sales drastically and it is closely related to the buying process. The presentation should be simple and attractive with details of the product. This is the best way to demonstrate the features and benefits of the prospect and shows how the product meets the customers' needs. This tools will be helpful to increase the desire and willingness of the prospect to purchase the product. The number of strategies may be adopted to motivate the prospects to buy the product in the future. If you satisfied your customer, next time they will call you and want to meet to know about something new product or existing. The percentage will be high to book some new product for your reference. They can justify the price of the product and suggest an alternative method of payment. If you want to sale your product instantly - you can say that demand for the product is so high and may be facing the shortage of supplies or enhancement in price. This tips will help to procure an order from the prospect. The today technique of Sales Presentation is based on Desire, Interest, Action, Attention, and Satisfaction. Attention should be through the proper approach and use a number of the device to increase the interest to purchase the product by the customer. This can be done through an effective sales interview and approach. You will be competent to resolve the grievances and objection raised by the customer intently. Customer satisfaction based on your services and attractive product features. Actually, a salesman generally uses three approaches to the sales presentation. the canned approach formulated the approach and need satisfaction approach. The canned approach is the more sales talk covering the main points based on stimulus-response thinking. The formulated approach based on the buyer's need and style. The passive approach based on the right stimulus - words, pictures etc. F) Handling Objections - Any time customer can raise objections to the product. The approach of objection may be psychological and logical. The approach of the customer may be like that - he can approach you to get some new product on behalf of the old one. They can resist or put the objection to product price transport and payment system. You will be fully prepared to satisfy the customer by your intelligent answer and overcome the customer's resistance. You can get knowledge of customer handling by proper training and practical approach. G) Closing - You will be very clear about the closing of your presentation. Close your presentation at the earliest possible to avoid the emergence of any adverse features to the product. You should be very clever to close the sales talk and get confirmation of the booking of the product instantly. Try to read the closing signal wave from other side and conclude your talk according to your physical, statement, comments and action. Help customer to select the product and give knowledge of product USP. H) Follow - Up - If you generate lead then follow up is necessary. If the prospect signs the order and asks about the time of delivery. You should arrange and manage the dispatch and delivery of the product on the given time. Try to remove the post-purchase issue. A smooth selling improves your sell and attracts customer easily. The sale is complete if your buyers are happy with service, product value, and clarity in selling. Follow-up action also provides feedback for you. These tips helpful to you for Sale Your Small Business Product instantly with ethics.